Counter Tops - Jacksonville Granite Inc.
can be a complicated process for even the most accomplished do-it-yourself handymen and women. To start with, self installation requires that you or someone you know have the necessary tools, not to mention the time required to complete the necessary planning and inspection to make sure you’re properly installing your new countertops. Between the assistance you’ll need for the heavy lifting and the equipment you’ll need for such tasks as making cuts in your chosen material, drilling holes for your anchors, and attaching your brackets to hold your sink in place, it can also get to be expensive as well. At Jacksonville Granite, our experts can help you with your countertop installation. Our experienced professionals have been there before and are here to make sure that you’re not alone in the process. Professional installation can get pricey, but we pride ourselves on providing an affordable and knowledgeable countertop installation. Why do it yourself when we can do it for you? Less stress and more free weekends to spend your time however you choose while admiring your beautiful new countertops! When you choose us for your countertop installation, we don’t just install your new counters. We are also available to provide services that include sealing your new countertops and tearing out and removing your pre-existing countertops in order to save you the hassle of disposing of them yourself. Doesn’t that sound easier? Please contact Jacksonville Granite today to inquire about countertop installation in your home. We’d love to help you complete your vision of turning your dream kitchen or bathroom into a reality. The Mcorb is a superior corbel that gives unmatched support for the entire bar top and countertop over-hang while remaining nearly undetectable. Ordinary corbels are usually made of wood and are always visible making it important to select the right style that goes with the décor of the rest of the house. Decorative corbels are expensive and offer far less support than the M Corb. Beyond just strength and support, the M Corb comes prime white and is easily painted to match bat top trim, concealing it further. Normal corbels or brackets take up space under bar top and dictate where people can sit, as well as where you can put bar stools or chairs. The M Corb however, frees up all this space so that people are no longer cramping their knees and are able to sit wherever they wish. Once the M Corbs are in place, setting and seeming the bar top is much easier and requires very little trimming. As a fabricator and installer of stone or quarts countertops, you want to stand out from the crowd. By offering our customers the option of having M Corb installed you give them a more stable and strong installation of their bar top or countertop overhang, as well as a custom and unique look that is highly functional, setting yourself apart from the rest. 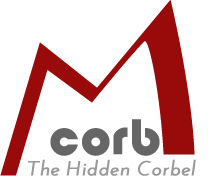 The M Corb is very affordable and come with a lifetime guarantee. Fabricators tell us that nearly every customer they do work for request the M Corb and it has increased their referrals as well.